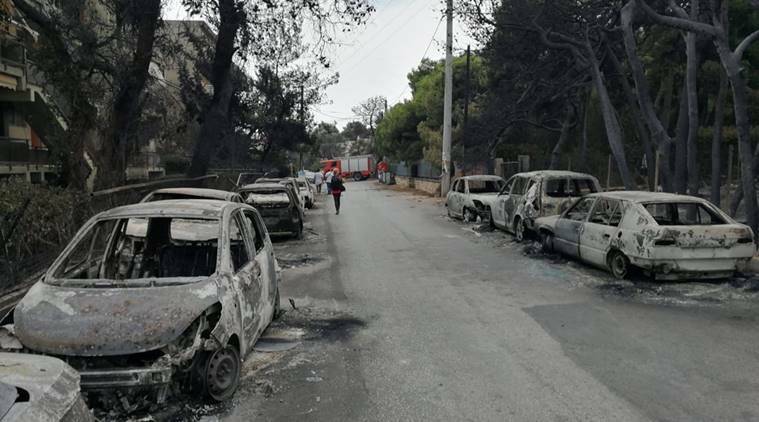 Greece will begin burying the victims this weekend of a devastating wildfire near Athens which killed at least 88 people and raised recriminations over the government’s handling of the disaster. Wildfires sweeping through a Greek resort town kill scores, including families with children found clasped in a last embrace as they tried to flee the flames. On Sunday, three members of the same family are due to be laid to rest in the first known funeral since the blaze broke out on Monday in the seaside village of Mati, 30 km (17 miles) east of the Greek capital Athens. Missing twin nine-year-old girls Sofia and Vasiliki Filippopoulou, whose pictures have featured internationally including in The Times newspaper, were confirmed dead, state broadcaster ERT reported on Saturday. DNA tests showed the pair, who had prompted a national outpouring of sympathy, and their grandparents had died in the blaze at Mati. Their grandfather’s burnt-out car was located outside a plot of land where 26 people died, with some of the victims found embracing each other in death, ERT said. The government has announced a long list of relief measures and promised to tackle decades-old problems, including haphazard and unlicensed residential building, to minimise the risk of a repeat disaster and cool public anger. A deputy mayor in Marathon, which administers some of the fire-affected areas, on Saturday became the first official to resign over the wildfire.